Arsenal have two top quality strikers in their ranks. Pierre-Emerick Aubameyang and Alexandre Lacazette have it in them to score the goals and do it with a certain degree of flair that would please the fans over at the Emirates. However, as Arsenal traverse through a difficult post-Wenger era, new gaffer Unai Emery is still testing out his options and making sure he's fielding the right combinations. 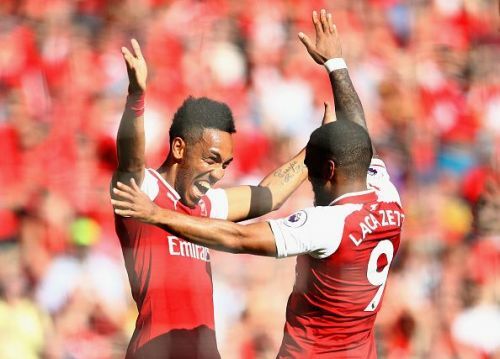 After the first few matches, there was an outcry from the fans pleading for Aubameyang and Lacazette to be deployed alongside each other and that, in fact, worked as Arsenal got past Cardiff by the skin of their teeth thanks to goals from the duo. Moreover, the pair has a positive off-pitch relationship as well. Last season, when Lacazette was struggling with form, Aubameyang decided to hand over spot-kick duties to his partner. They seem to be getting along just fine and seems to thrive in each other's company. Now, Unai Emery himself has weighed in on the debate and offered his perspective on the issue. “It’s the same. It’s a process to know the combination on the pitch, with different players." “But I need and I want to start in the level, 11 players with good performances." “And also, we need in the balance of players, when the team needs to work in the pitch to help the team to find the win, to stay with the performance." “The reason is that I am very happy with the last two victories in the Premier League and also with the performances." Arsenal will be travelling to St. James Park tomorrow to play Rafa Benitez's Newcastle United. Last season, when the Gunners suffered a defeat in the same fixture, it was Aubameyang and Lacazette who combined to get Wenger's men their only goal of the game.